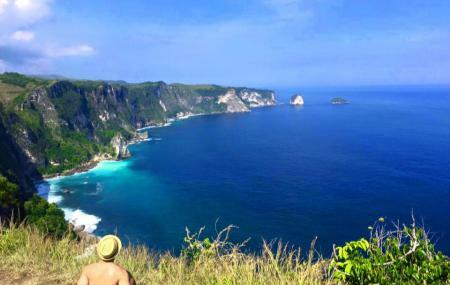 The island of Nusa Penida is known for its towering cliffs, beautiful beaches and hidden cultural gems. Saren Cliff Point is a treat to the eyes and a real find for the camera! When you reach this high cliff, and look around, the view looks right out of a movie. Saren Cliff Point is breath-taking, and the panoramic views inspire all sorts of artistic expression. The azure waters matching the colour and depth of the sky, meeting the lush green land with a dash of white sand in the middle - It is spectacular! A beautiful and quiet spot. No one to be seen for a good half hour when I was there. The views of the cliffs are spectacular and quite unique. Just be aware that the access path is very rough. Definitely not suitable for cars. Take it easy on a scooter! Well, what can I say. This place is stunning. I was very fortunate that when I got there, I had the whole place to myself for a good half hour to 40 minutes. So peaceful there. There are two sides. Both were equally beautiful. Highly recommend if you're in Nusa Penida you must go take a look for yourself. Beautiful spot to relax and enjoy sunset, crazy overhang cliff with sheer drops! View is lovely too. The track is very long and bumpy, as many others have mentioned. I managed it on a scooter, but it definitely wasn't good for it! If you are a very good scouter driver go there..